Can you eat real sushi outside of Japan? Sushi is often the first thought when thinking about Japan, and sushi restaurants are created all over the world. However, if what we get in them is actually real sushi? For Japanese, rice and fish are two basic pillars of the diet. Served as sushi, they have been their favorite delicacy for a long time. The origins of sushi date back to ancient times and rituals involving sushi has still conducted at shrines as offerings to the deities. Two centuries ago sushi became extremely popular in the city of Edo. It was then that sushi masters developed their sophisticated skills. Sushi are small portions of fish and rice mainly. It looks very simple, but in fact the method of preparation has been developed over the centuries, thanks to the ingenuity and craftsmanship of Japanese chefs. Cooked rice is mixed with vinegar and prepared into bite sized servings. This is the basis for many different sushi ingredients that are called Neta. Neta is usually seafood, red and white fish, shrimp or squid, all kinds of shellfish. There is a tremendous variety of toppings. The most important thing is that the fish is fresh but some of them reach their best taste a day or two after being caught. 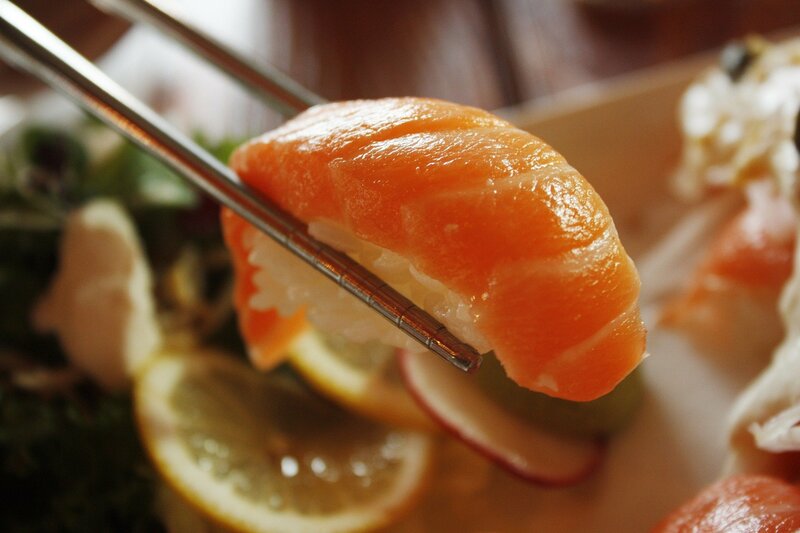 Recipe for top-class sushi is fresh fish cut into pieces of the appropriate size and thickness. Rice is another important ingredient of good sushi. It is cooked and then blended with vinegar. Besides adding a tart flavor the vinegar also acts as an antibacterial agent. It takes skill to mix the vinegar into the rice using a paddle without crushing an individual grain. Then the rice must be fanned to remove excess moisture during cooling. Sugars in vinegar form a coating around each grain of rice. Thanks to this, they do not become too sticky and retain their taste. Properly prepared rice should have a shiny coating. There is a special technique for preparing nigiri sushi, because this type is usually eaten in Japan. Neta is held in the left hand and rice is formed with the right hand. A bit of wasabi is placed under the fish, and then it is put on rice. In a few seconds the sushi is ready. In nigiri sushi prepared by a skilled sushi master the topping and the rice are so closely joined they don’t come apart easily. Even tests in the wind tunnel were made ;). It was only when the wind was 90 km / h that the fish fell from rice. Despite such a good combination of fish and rice, rice remains fluffy thanks to which it does not lose its taste. Nigiri must be prepared with the right strength and in a very short time. So it won’t fall apart, but also not being crushed and heated by human hands. Although sushi is a traditional Japanese dish, it doesn’t require any sophisticated when tabel etiquette. You can do it with your hands or with chopsticks. When you dip your sushi into soy sauce the part that you dip is the fish and not the rice. If you dip the rice in the sauce it all falls apart. Some kind of sushi are seasoned by the chef and don’t require any dip at all. You shouldn’t also bite sushi, but eat a whole piece at once and enjoy the taste. Omnomnom …. 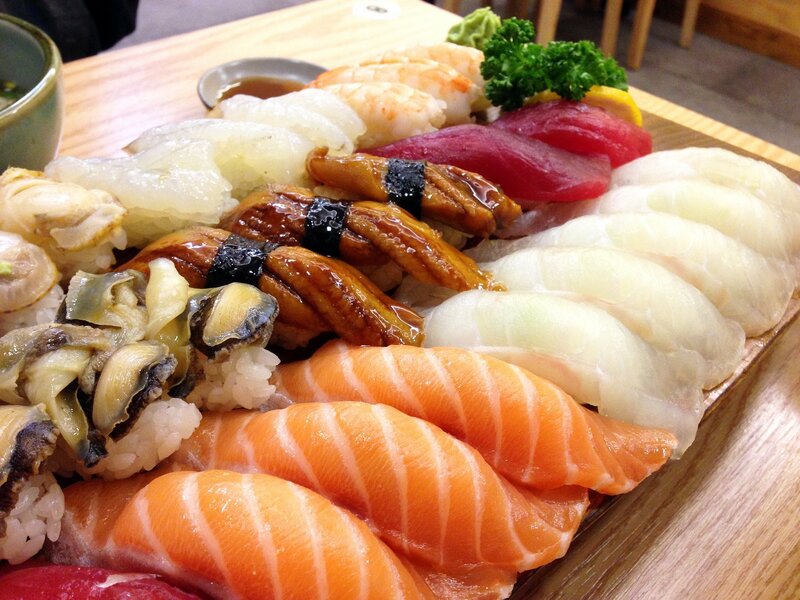 Nigiri sushi is eaten in Japan for about 200 years. It’s quite different from the way the sushi was originally eaten. Funa-zushi was just a fish. 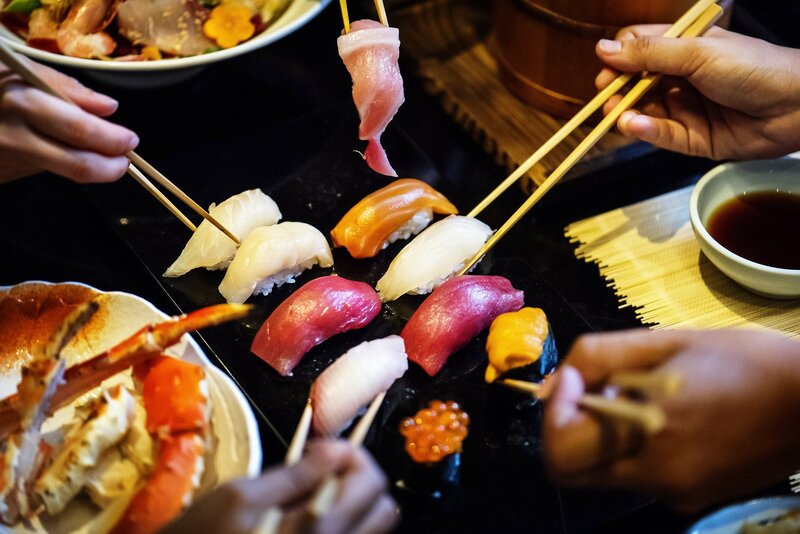 In ancient times, sushi was a way of preserving food through a fermentation process. The fish was rubbed with salt then packed into a bed of cooked rice and left to age for between sic months and two years inside the barrels. Rice caused the fermentation of the fish, which turned into Funa-zushi. Lactic acid bacteria turned the cooked rice into a porridge like consistency but it wasn’t eaten. Such sushi looked very tasty and smelled wonderfully… mmm … Because this way of making sushi spread to other parts of the country, each region has developed its own varieties. Over the years, sushi has become festive food during festivals and special occasions. 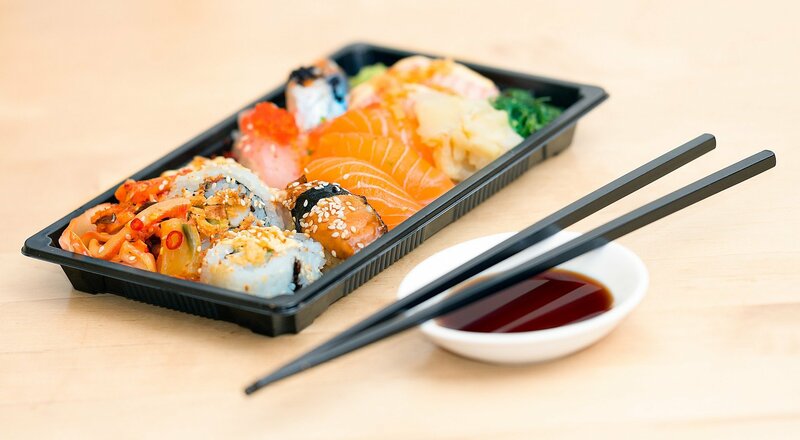 The modern form of sushi was created in the early 19 century. At that time, new forms of food were being developed that would fit into the informal style of special street food stalls that were then being created. That’s how nigiri was made, rice with pieces of fish freshly caught in Edo Bay. It was prepared by hand on the spot making it perfect fast-food. The new sushi was fast, tasty and it became a hit among the locals. The master sushi chefs of Edo continued to explore ways of making their sushi even more delicious. 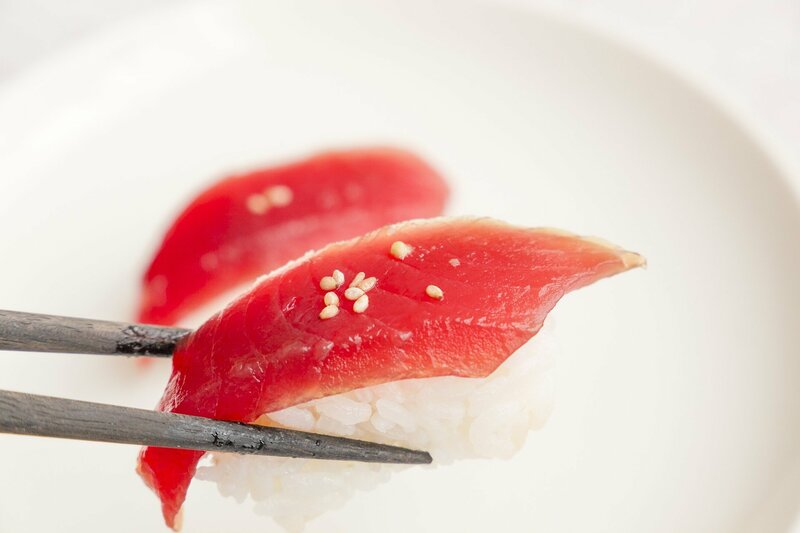 These days the king of sushi toppings is maguro tuna. The Edo chefs used to drench the maguro with hot water, salting it on the surface then it would be placed in a marinade prepared with soy sauce. This style called Zuke was the favorite sushi style in Edo. Sushi has evolved from ancient times, when it was a method of preserving food, to contemporary sushi nigiri. Answering the question in the title, can you eat real sushi outside Japan? The answer is: it depends;). 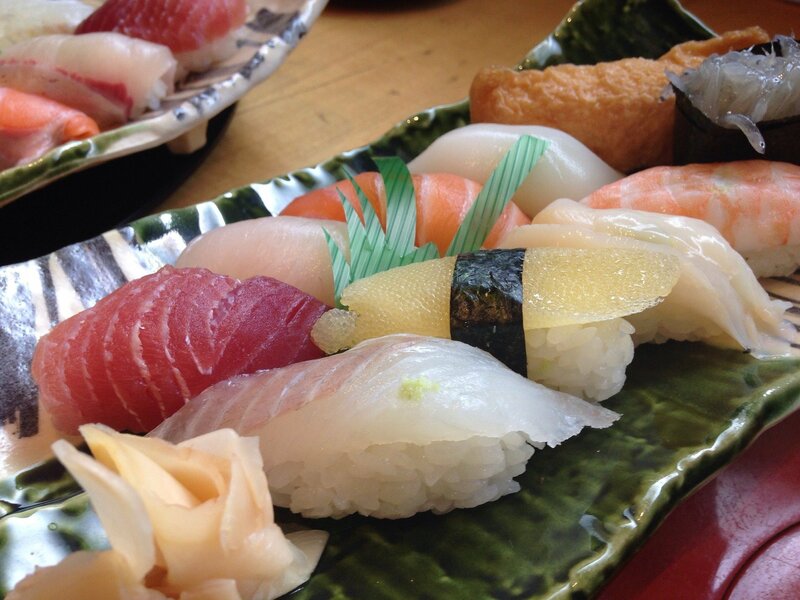 If you order nigiri or simple rolls with one or two ingredients, then it is sushi, which you will also eat in Japan. And although the sushi is still evolving there and new ideas are emerging, such as nigiri with vegetables for vegans, sushi rolls with millions of ingredients, mayonnaise or philadelphia cheese are not eaten in Japan. Of course there may be a couple of restaurants serving California rolls, but I doubt it honestly. Japanese sushi is about feeling umami in seafood and rice, while every additional ingredient just kills it.